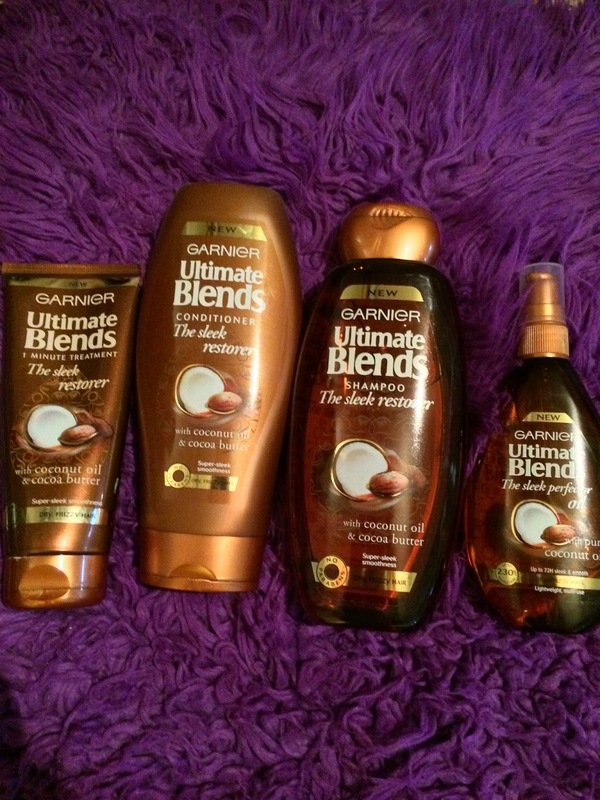 Today's post is going to be a review of my most beloved Garnier haircare range. 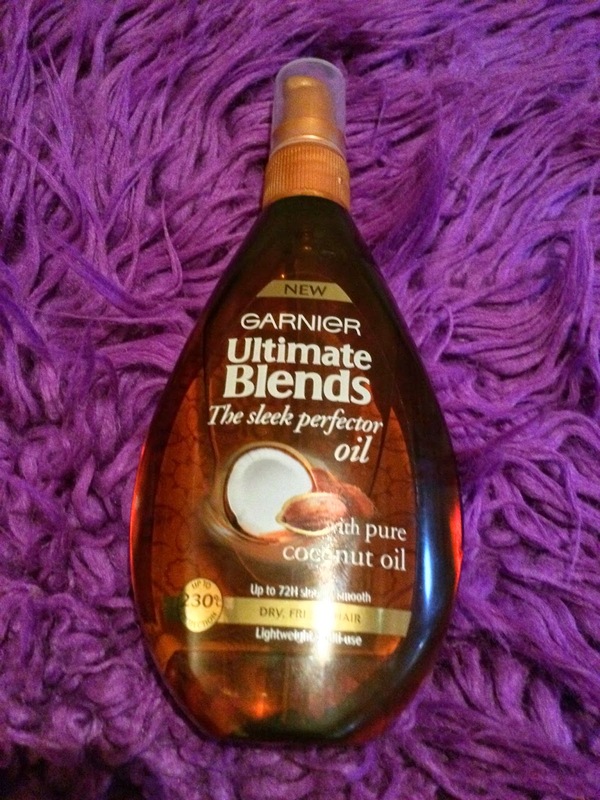 I began using Garnier Ultimate Blends when the collection came out a few months ago. I have tried every product within each range of the collection and I am going to review my favourite one which is the coconut oil and cocoa butter based range ('The Sleek Restorer'). There is also an avocado oil based range ('The Nourishing Repairer'), an argan oil based range ('The Marvellous Transformer'), a green tea and lemon based range ('The Shine Revitaliser'), an argan oil and cranberry based range ('The Colour Illuminator'), and a vanilla milk based range ('The Silky Smoother'). Each range includes different products. They all include a shampoo and conditioner and some include a dry shampoo and a one-minute treatment. The Sleek Restorer is the only range to include a hair oil. The Sleek Restorer range includes a shampoo, conditioner, a one-minute treatment mask and a hair oil. I love all of the products in the range and use them regularly. The shampoo lathers well and smells absolutely divine, like cocoa butter! The two conditioners in the range smell just like the shampoo. The normal conditioner has the consistency of a usual conditioner and the one-minute treatment is a lot thicker. Both work really well. As for the hair oil, it's to die for. I have about 6 different hair oils on the go but I always reach for this one. It's super nourishing but not heavy at all and it never makes my hair greasy. The smell of coconut oil and cocoa butter really lingers on your hair after using this and it prepares the hair well for styling. My hair is very long, it's about bum length and it's naturally curly. My hair can get frizzy sometimes but not extremely so. Fly-away hairs are the problem. I like my hair to be sleek and tidy looking and these products definitely help me to achieve that. All of the Ultimate Blends collection is great, but I see the most difference in my hair when using the whole coconut oil range. I generally use the coconut oil shampoo and conditioner twice during the week and the one minute treatment once. I apply a pump of the hair oil every day before styling. Since using these products, my hair is regularly complimented which is nice! I'm not sure whether this is because it adds build up to my hair... However my hair is so shiny, nourished and rich in colour! I regularly buy the shampoo and conditioner and rotate these with my LUSH shampoo bars as I find that my hair looks a lot healthier when I change things up a bit. £££: Shampoo £3.89 PER 400ML, Conditioner £3.89 PER 400ML, One-minute treatment £4.49 PER 150ML, Hair Oil £9.99. These products are pretty inexpensive considering their quality and they are regularly on offer at Boots and Superdrug so you can usually pick them up cheaper.